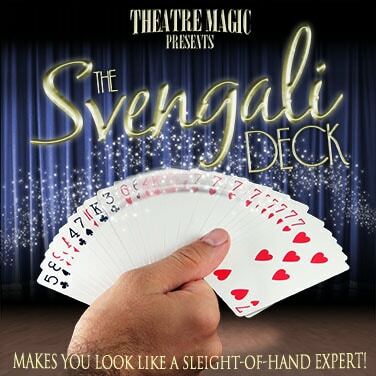 This Svengali Deck is THE quintessential “trick” deck of cards. It was, in fact, the first specially gaffed deck that I purchased when I started learning magic at seven years old. If you’ve been studying magic for any period of time, chances are good that you already own a Svengali Deck. If you don’t own a Svengali Deck, I encourage you to stop reading right now and order one immediately! This deck is a diabolical weapon of mass destruction that allows the performer to accomplish numerous magical miracles with almost no effort. Although the deck is specially designed to make these miracles possible, it can be dribbled or riffled to display the faces of the cards and create the illusion that the deck is completely ordinary. It can even be shuffled! This is something usually not possible with a special or stacked deck of cards. The Svengali Deck is based on an old principle that can be found in The Discoverie of Witchcraft and Clever and Pleasant Inventions (both from 1584). Magician Burling Hull was advertising a deck with the same mechanics in the February, 1909 issue of The Sphinx as “Cards Mysterious,” and two years later, in his book Sealed Mysteries, he claimed it as his invention that he had copyrighted. In between the initial advertisement and Hull’s subsequent claim, a description of the idea appeared in Ellis Stanyon’s New Card Tricks, 4th Series in 1910 as the “Third Arrangement” of The “Fin de Siecle” Magic Pack of Cards. That was the name Stanyon gave to all decks using this principle described in Clever and Pleasant Inventions. W.D. LeRoy appears to be the first to sell it as the name “Svengali”, which comes from George du Maurier’s 1894 novel Trilby where Svengali is a fictional hypnotist in the novel. The Svengali Deck has gone by many names over the years and there are many variations including the Mirage Deck, The Phantom Deck, and, in Europe, it has sold under the title of Radio Deck. Joe Berg’s Novel-Gali Deck which, in addition to the changing faces, added a color changing back. Al Stevenson’s Blanka Deck made use of blank cards. Theodore DeLand also incorporated the Svengali Deck principle into a version of his Inverto effect so the deck could be displayed more freely. Joe Stuthard’s Trilby and Bi-Co Trilby Decks are variations on this deck. In the 1960s and 1970s, Marshall Brodien sold 17 million Svengali decks under the name TV Magic Cards. The principle has been used as a method to force anywhere from 1-3 playing cards from a deck, and has even been applied to writing pads and books to coerce a spectator to choose the content of a seemingly random page – most often a word. One of the most popular demonstrations of the Svengali principle can be found at children’s parties by magicians performing the Magic Coloring Book! Which only goes to show that, with a little ingenuity, this principle can be used to create some astonishing feats of magic even beyond the realm of playing cards. Still, there is something thrilling about holding a Svengali Deck in hand knowing with full confidence that you are about to blow the minds of your audience with nothing more than a seemingly innocent pack of cards and they are going to give you all the credit for exceptional sleight of hand skill. Don’t worry, like all good magicians, we’ll keep your secret.